The main character in my picture book The Black Rabbit originated from an animation I made years ago at college. A small white rabbit only had a small supporting role, but I liked him so much I wanted to use him in a story of his own. The way he was drawn with short, stumpy little legs meant he moved in a certain way. I loved the way he ran, his short legs meaning he comically wiggled from side to side and had to put in a lot of effort. It can be such a long process to get the story right and sometimes I will go back again and again revisiting ideas. Ideas are all around us, but it can be hard to recognise them and after a long time spent looking for the plot idea for The Black Rabbit, one day it just popped into my head. I have my own two little house rabbits who are always together, following each other around. They are easily spooked and can jump at the smallest noises or movements. 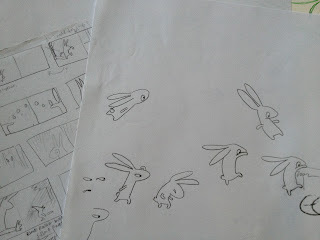 I had been drawing Rabbit running in different situations when the saying -scared of your own shadow popped up. I then wondered what would happen if there was real danger? I find it easier to write and illustrate the book together and try to balance the words and pictures. If the pictures show something, this does not need to be repeated in the text, which I like to keep very minimal. There needs to be a good interaction between the two. If the story can be told in a better way with a picture then the text can be as minimal as possible. 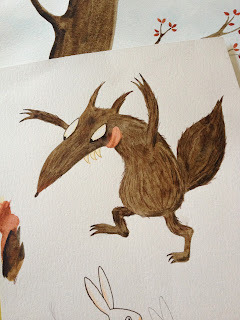 Illustrating The Black Rabbit was a bit of a challenge at times as my baby daughter was only a few months old and I had to pick up my paintbrush whenever she napped. The illustrations are drawn with pencil and then painted mainly with watercolour but I use ink and coloured pencils too- anything I think will work best and then I tweak the final illustration a little digitally. 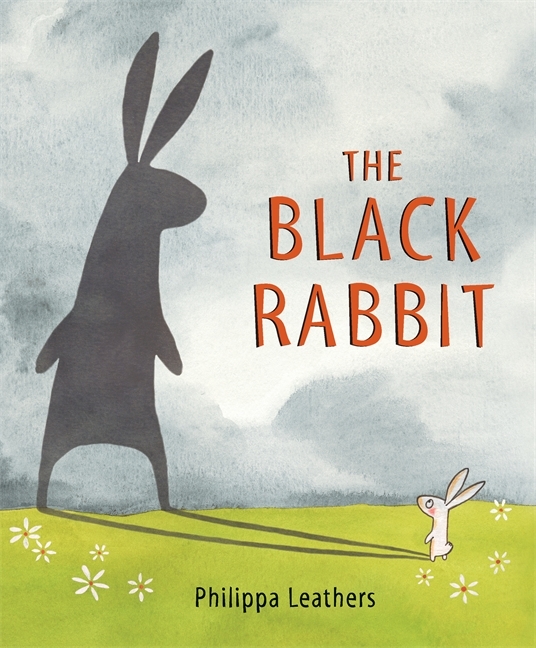 The story The Black Rabbit is about a rabbit who is afraid of his own shadow, seeing it as a large frightening creature who follows his every move. Rabbit tries to escape this large black rabbit and eventually in the deep, dark wood, manages to do so, only to encounter something more dangerous…. I hope you like it. Join in the fun and download your Black Rabbit activity sheet here. 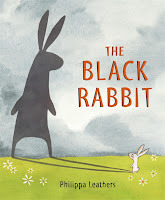 Find The Black Rabbit at your local bookshop here.